What can be more annoying than having your phone bombarded with unsolicited messages you don't remember ever subscribing for from your telecom operator and even been charged for it. Unfortunately this has become a norm among telecom operators here in Nigeria and the so called NCC has been quiet about this. If you leave in Nigeria and you use any of the telecom networks then this is no news to you. As annoying as it is you find it almost impossible to opt out of those annoying daily messages even when you call the customer care. 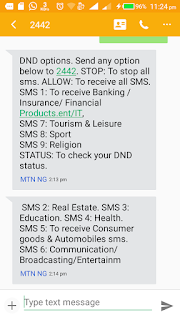 After the unnecessary wait, NCC has finally decided to take action by threatening any telecom operator that sends unsolicited SMS to its customers with a fine. 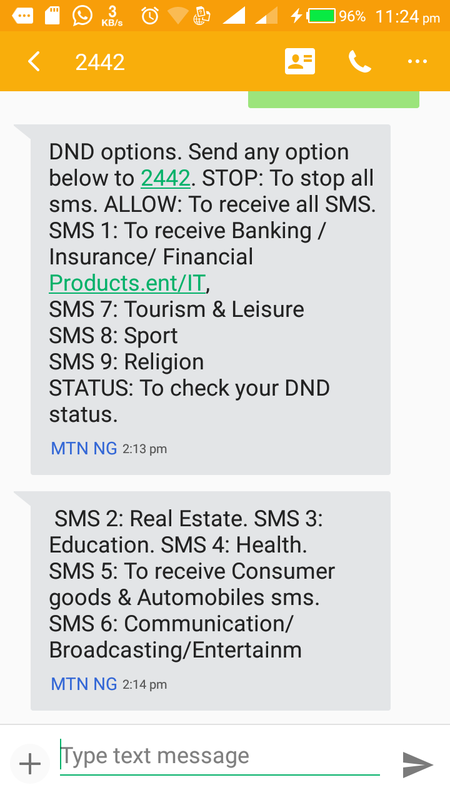 So to avoid being fined, mtn and etisalat has introduced introduced Do-Not-Disturb (DND) list, which lets you easily opt out of any service you want. Text HELP to 2442 and you will recieve an sms with instriction on how to optout from any of rge categories. To opt out, text Stop to 2442 and you will receive instructions on how to opt out and also the list of all the categories. Note that this service is completely free and its available for all users.